WordPress users are lucky to have built-in plugins of their own for adding Instagram feed to their sites but for blogger it's not like that. You have to either use a third party service or make your own plugin for adding your Instagram feed to blogger. 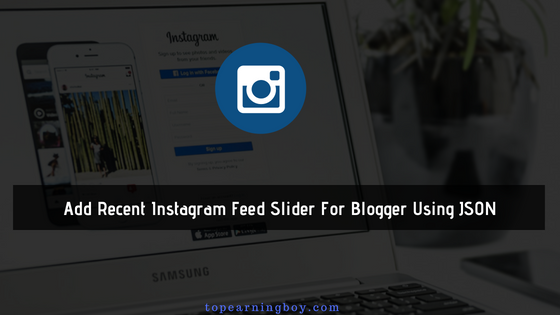 After releasing tutorials like muti-level sidebar navigation and hamburger drop down menu finally today we are releasing the most advanced recent Instagram feed slider for blogger which will display your Instagram feed in descending order i.e from latest to oldest. The best thing about it's that it slides automatically with amazing fade-in and fade-out animation that makes it more dynamic. You can call a blogger widget good if and only if it loads fast and doesn't harm your blog load time. You could find a bunch of widgets online that are not even optimized and hurts your blog load time so we designed this widget by keeping that in mind. Note: You would rarely find such widget online! Since we are fetching data using Instagram API so remember that days gone by when we could get from Instagram as much photos as we want. Those times are gone now and Instagram security is much stronger than it was before so we had to generate our access token for developing the widget. Save that access token for now. We will be using it later. That simple! Don't feel secure? You might have question about your Instagram access token that what if someone else gets your access token? If someone gets your access token then don't worry at all. He can't do anything with the token except browsing photos. The token doesn't give access to any type of personal data! Change fading time and opacity as your requirement. Replace 5000 with 7000 if you want the slider to switch after 7 seconds. Replace Access Token with your generated access token. Remember that no. of photos doesn't exceed 20 because Instagram API doesn't allow it anymore. Instagram decided to stop endless spam and created Sandbox Mode so now you can only fetch latest 20 media. I have tried my best to make this tutorial as simple as possible and if you learned from it then link back to this page. Now I want a sincere feedback from all of you in the comments section to let me know if you liked it or not and what else do you want from this tutorial? Comment below and I would love to answer. Stay blessed always!